[Contest] 31 Days Of Beauty Giveaways! We’re celebrating Singapore’s birthday in style this year by giving away 1 beauty treat every day in August! To take part, you simply have to check in to our Facebook Page at 9pm every night. Of course, only Material World fans are eligible for this contest so remember you’ll need to Like our Facebook Page. Please read our Rules & Regulations before you enter any contests on Material World. By becoming a follower of our Twitter account, you will get TWICE the chance at the draw. So be sure to follow us on Twitter! We promise to keep you entertained with updates, pictures, and random stuff. Good luck and Happy August, everybody! Many people in Singapore suffer from excessively oily skins. The heat, the sun, the dust, and most recently the haze, all lead to many of us sporting an unattractive glaze over our faces. For women, our makeup tends to melt into a muddy sludge by lunchtime. For men, they often have to tackle skin roughness along with oiliness. This tropical heat is indeed our complexion’s worst enemy. Instinctively, many of us reach out for purifying, anti-shine, oil-absorbing skincare. But it could be that we are heading in the wrong direction. My first encounter with the idea of using hydration to combat excess shine happened about five years ago. Then I was suffering from insanely oily skin and acne. I was experimenting with all sorts of anti-shine products in the bid to keep the oil under control. That event changed everything I thought I knew about skincare. What do we usually do when our skin gets too shiny? We either blot it or we wash it. Apparently, that only serves to aggravate the problem. Think of our skin as an “ecosystem”. As with any living environment, balance is key. When the surrounding gets too cold, your body actually revs up its internal temperature in an effort to keep you warm. Similarly, if your skin gets too dry, your sebaceous glands (they produce sebum) go into overdrive producing oil to keep your skin from drying out. Why? Dry skin is more easily damaged than moisturized skin. It is also more prone to infection and inflammation. it also nourishes bacteria. For those suffering from acne, excess sebum can be a nightmare. If you want your skin to produce less oil, the key does not lie in oil-absorbing products. The secret is actually hydration. 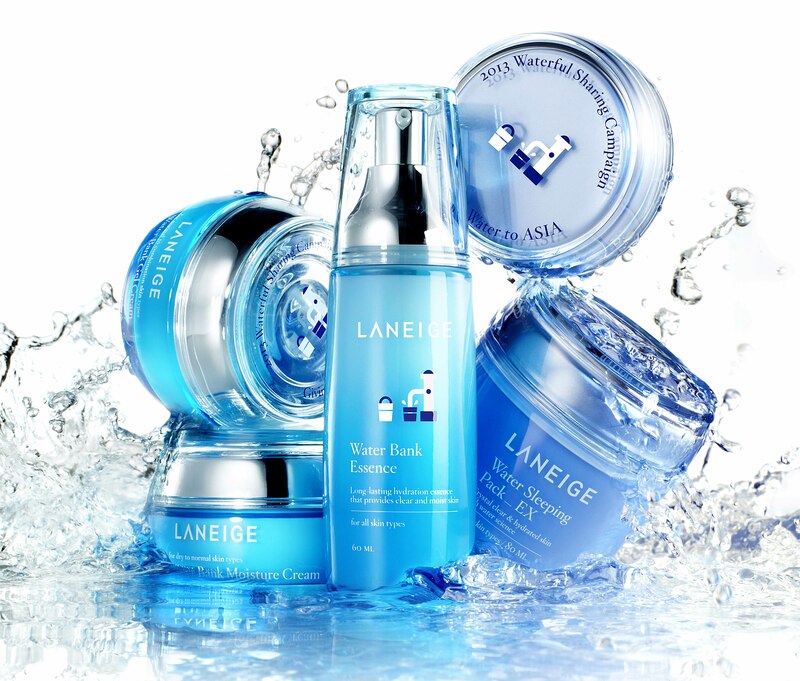 Out of the many hydration skincare out in the market, one of the most highly lauded brands is Laneige. The brand has a 19-year history of researching moisture balance inside a skin cell. This year, it has created the Optimal Mineral Water and put it into its Water Bank series. My high-stressed lifestyle is catching up on me. Along with the fact that I’m almost in my mid-30s, my complexion is severely dehydrated and tends to get very oily. I tried the Water Bank Essence ($48), the Water Bank Gel Cream ($52), and the Water Sleeping Pack EX ($45) for two weeks. The Essence has a light, gel-like texture, and is absorbed easily into the skin. You can massage it in but what I like to do is spread it thinly on just cleansed skin and give it 30 seconds to be completely absorbed. The Gel Cream is the next step. If your skin is dry to normal, you might like the Water Bank Cream (also $52) better. Again, the moisturizer sinks into the skin. I like how soft my skin actually feels after. At night, after the Gel Cream, you can layer the Water Sleeping Mask EX over it. This step deeply hydrates your skin while you’re sleeping and enhances its ability to repair itself. If you are iffy about going to bed with a layer of product over your face, you can sit around, watch some TV and, after about 30 minutes or so, the product should have sunk in, leaving just a barely discernible sheen over your face. When the haze hit Singapore, I was reviewing these products. I’m glad to report that I did not suffer from any irritation or breakouts. Just before a six-hour flight recently, I applied a thin layer of the Sleeping Mask on my skin before leaving for the airport. Usually, my skin would be flaky and oily upon arrival. This time around, I managed to look quite fresh-faced for once. Starting from July 5 2013, you can buy products from the Water Bank series sporting a limited edition packaging designed by Finnish artist Lotta Nieminen. Proceeds from this collaboration will go towards the UNICEF WASH (Water, Sanitation and Hygiene) project, which aims to provide fresh, clean water to poor, underprivileged communities in Asia by building proper water pump facilities. The limited edition Water Bank series will be available from July 5, 2013, at all Laneige counters and boutiques. Material World worked with Laneige to review the Water Bank series to help raise awareness for the Waterful Sharing Campaign. All opinions are the author’s own and were not vetted by the client. You may read our advertising policy here. About The Author: Deborah Tan is a founder of Material World. After 10 years of working in magazines Cleo and Cosmopolitan Singapore, she is now a freelance writer/editor who works on this website full-time. She likes liquid eyeliners, bright red lipsticks, tattoos, rock & roll, Mad Men, Suits, and strongly believes that we can all do our part to make the world a better place … Follow her on Twitter @DebTanTweets. 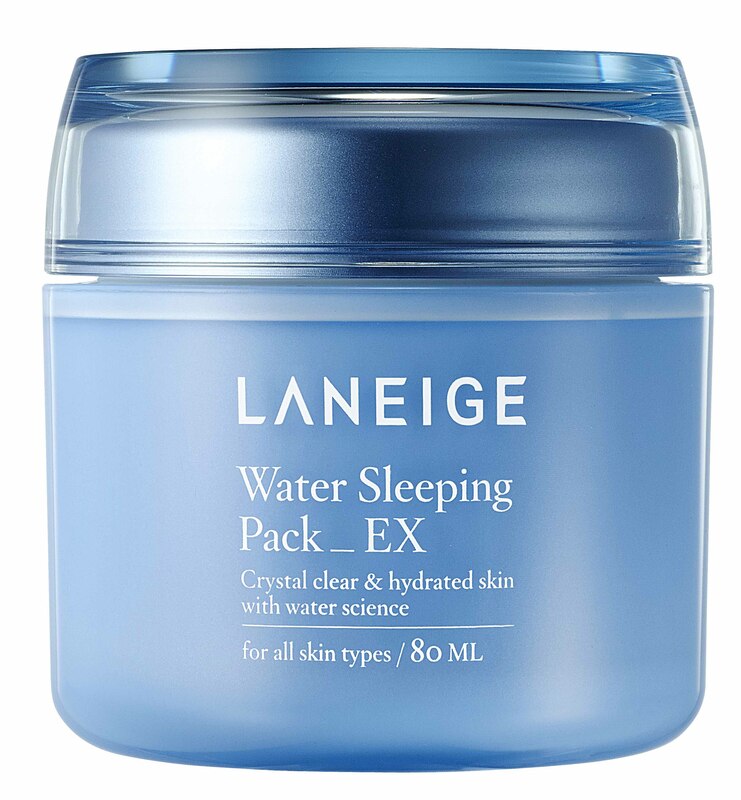 WE HAVE A TOTAL OF 5 LANEIGE WATER SLEEPING PACK EX TO GIVE AWAY! These will feature the limited edition packaging designed by Lotta Nieminen. Contest ends July 8, Monday, 2013. Over the years, I’ve become inseparable with my four-inch heels. But since starting this business, I’ve been working from home and, needless to say, my wardrobe has become a lot more casual. Instead of heading into the office every time there is a meeting to attend, I am usually headed for the homes of one of Material World’s founders. To wear four-inch heels to a house-meeting would be impractical and ridiculously unsuitable. I find ballet flats uncomfortable because my feet have very high arches. I am simply not a sneakers-girl like Denise and, God forbid I’ll ever walk around town in a pair of trainers! And if flip flops are too casual, what then can I wear instead of heels? I recently found a happy solution – Holster. Made with a pioneering PVC that does not make your feet sweat, these sandals are anti-microbial and vegetarian/vegan-friendly. The “Dannii Minogue for Holster” collection is available at Not Too Big at Forum The Shopping Mall, Level 2. Win a pair of Dannii Minogue for Holster here! 1. Answer this question: “Name ONE of the features of the PVC used to make Holster sandals.” Leave your answer in the Comment section below this post. 3. Private Message your details (Name, Age, Gender, Email Address, Mailing Address, NRIC) to Material World’s Facebook Page. Only followers of Material World on Facebook qualify for this giveaway. Contest ends this Friday, 14 June 2013. All opinions are the author’s own, Holster and Not Too Big did not pay for this post. Please read our advertising policy here. About The Author: Deborah Tan is a founder of Material World. After 10 years of working in magazines Cleo and Cosmopolitan Singapore, she is now a freelance writer/editor who works on this website full-time. She likes liquid eyeliners, bright red lipsticks, tattoos, rock & roll, Mad Men, Suits, and wonders if she should consider Vibrams as her running footwear now. Follow her on Twitter @DebTanTweets. This iconic landmark harks back to the almost-forgotten era of colonial Malaysia. 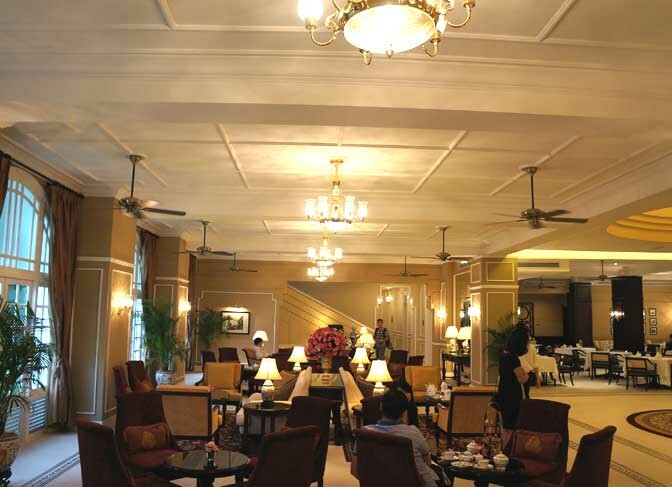 Built in the 1930s, the hotel retains its old-world charm but has been given a contemporary update by talented Malaysian architect Zaidan Tahir. We arrived at the hotel on Saturday afternoon, and were immediately whisked away for a hotel tour followed by a business dinner in the evening. 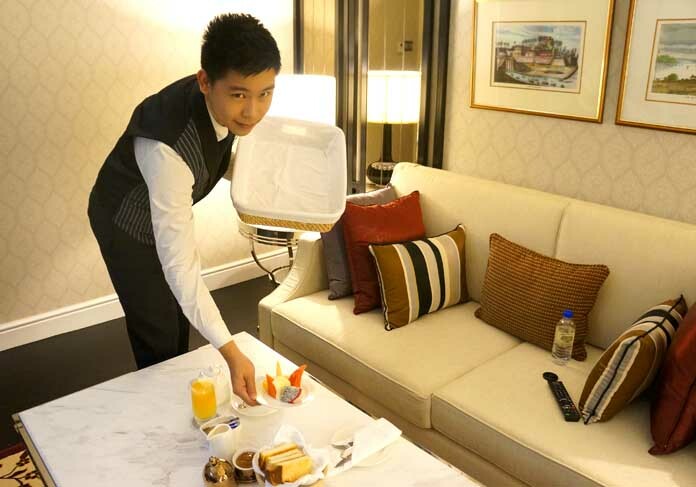 The suite I stayed in was large – there were two rooms and two television sets – and was located in the hotel wing that included round-the-clock butler service.While it was thrilling to experience butler service (check out the picture below! ), I only had Sunday morning to explore the city so I knew I couldn’t hole myself up in the hotel for too long. I decided to check out Bangsar, a chic suburb about a 15-minute drive away. The weather in KL was as scorching as the weather in Singapore. As I stepped outside the hotel, I was confronted with a wall of searing heat and dust. That got me worried. I was recovering from a case of chemical burns from using an over-the-counter pimple cream and the last thing I wanted was for them to get worse. I hoped the Shiseido sunscreen I’m wearing would do its job protecting my fragile skin. My companions were amused at my vigilance – I obediently reapplied my sunblock every 2 – 3 hours – but admitted that the sunscreen blended flawlessly and did not leave behind a whitish mask. Bangsar is home to many upmarket eateries, shops, and even a shopping mall that houses familiar favourites like Zara and Ted Baker. The rows of short, squat buildings and trendy cafes reminded me of Holland Village, my stomping ground in Singapore. While I didn’t have time for retail therapy, I managed to indulge in some sinfully delicious French baked goods at the five-month-old French boulangerie called Yeast (12 Jalan Telawi 6, Bangsar Baru 59100, Kuala Lumpur Malaysia, Tel: (603) 2282 7112). About 80 percent of the stuff they use is imported from France, from the ovens right down to the flour. And yes, they make their own yeast, hence the name. 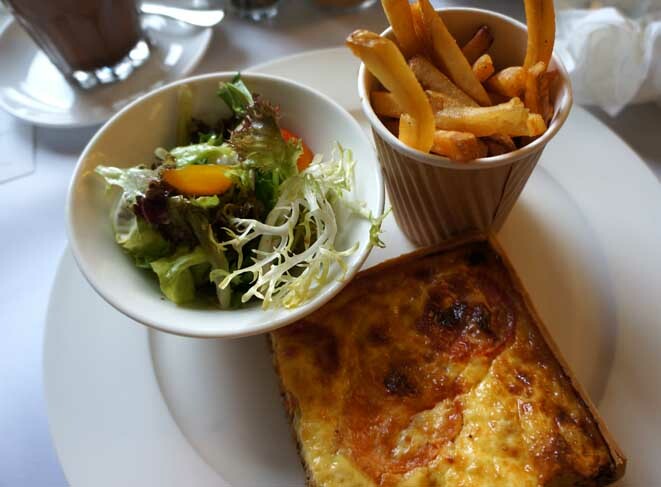 I had the tuna and Dijon mustard quiche, which was buttery and oozing with flavour. Delicious to the last bite! After my meal at Yeast, I had rush back to the hotel to refresh myself and pack my luggage before leaving for the airport. As the train chugged its way out of the city toward the airport, I couldn’t help but feel wistful that I didn’t have more time to explore the rest of the Malaysian capital. From whatever little I managed to check out, Kuala Lumpur has really transformed drastically since my last visit 10 years ago. According to Christophe, the owner of Yeast, Bangsar is just one of many up-and-coming suburbs in the city and the posh nosh scene in KL looks set to revolutionise within the next few years. Well, when it does, I’ll definitely be back to check it out! “A bad episode with an anti-acne treatment recently left a burn mark on my face, so I was extra vigilant about shielding my skin from the sun. The last thing I wanted was for dark patches to form! Before this trip, the Material World girls met up with Iris and Cassandra from Shiseido and were introduced to the brand’s latest range of sunscreens. These sunscreens target the microscopic gaps in your skin, ensuring lotion is spread evenly across the tiny ridges and furrows, leaving no room for UV rays to penetrate through. What I personally love about this sunscreen is its watery texture, and how you can apply it without a mirror – it blends into your skin that easily! Unlike the thicker, gloopier consistency of cream-based sunscreens, I didn’t need to check a mirror to make sure I had applied mine evenly. I can just apply it on the go. Another advantage of its lightweight texture is how it doubles up as a makeup base. Because it smoothens out the surface of your skin, my BB cream went on much more evenly after. 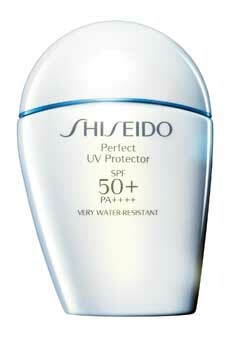 Apart from the Perfect UV Protector SPF 50+PA++++, Shiseido Suncare also comes in three other variants. 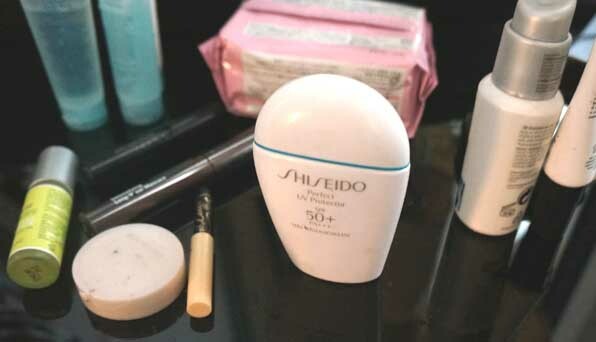 Click here to read our reviews of these Shiseido sunscreens, and find out how you can score a 3-day sample. This article is brought to you by Shiseido. All opinions expressed are the author’s own and were not vetted by the brand’s owner. 1. Share this post with your Facebook friends by clicking the Facebook button at the bottom of this post. 2. Tag Material World’s Facebook Page. 3. Then Private Message us on Material World’s Facebook Page with your details (Name, Age, NRIC No, Occupation, Email Address). 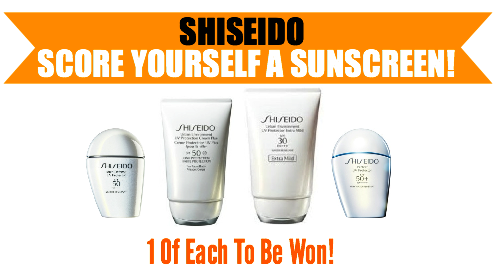 Remember to state clearly that you’re entering the Shiseido contest. Only followers of Material World is eligible for this contest, please Like our Facebook Page here. Failure to follow all 3 steps above will result in disqualification. Winners will have to be prepared to collect the sunscreens in person at a time and place stated by Material World. We will not be sending the prizes to you by mail or by courier, please take note. Contest ends May 28, 2013. You can also score yourself a 3-day sample! Click here to find out how to claim it. There’s nothing quite like a hot, fresh cup of coffee to kick off the morning. And it was for this reason I bought the Piccolo system when Nescafe Dolce Gusto launched in the market about a year and half ago. The system’s ease of use, coupled with the affordability and quality of the capsules, meant that I no longer had to drag my half-awake self to the nearest coffeeshop to get my caffeine fix. I even installed a second one on my office table – that was how much I needed coffee to function. 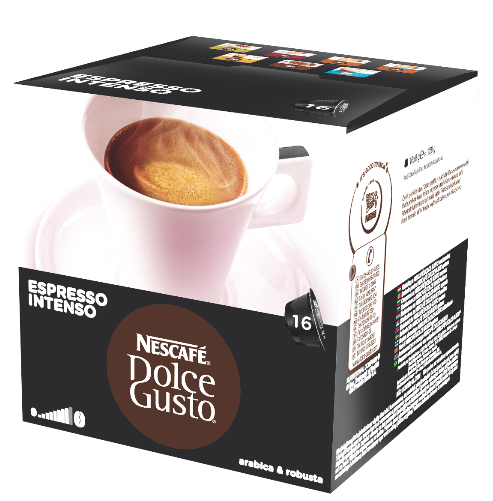 Recently, Nescafe Dolce Gusto introduced a new system to the family – the Melody. While the Piccolo is the most basic system in Nescafe Dolce Gusto’s line of multi-beverage machines (yes, they make tea too! ), the Melody takes it all to a whole new level. While the Piccolo required me to manually remove the water tank to fill up, you can fill up the Melody’s without removing it. With the Piccolo, I have to estimate when to stop the machine to get my desired intensity of coffee. 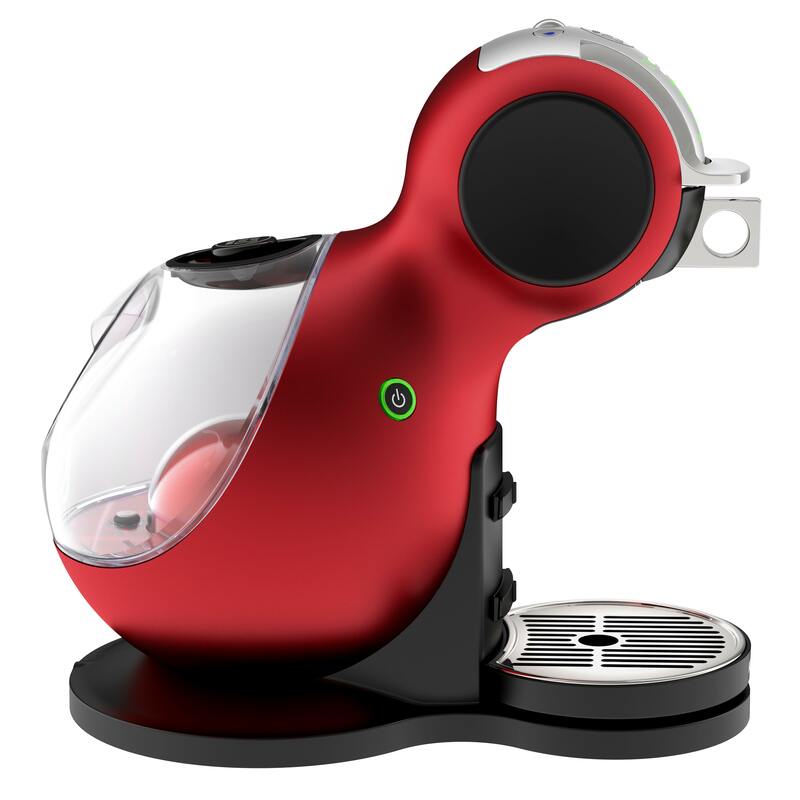 With the Melody, there is a scroll wheel that lets you choose from 7 different dosage level. Best thing about the Melody? It makes both COLD and HOT beverages. So if you are using a Peach Tea capsule, for example, the machine is able to make your tea cold. A chilled drink with a simple press of a button … it’s enough to make me break out into a song. The new system isn’t the only thing Nescafe Dolce Gusto has launched. The brand’s also introduced 3 more variants into its capsule collection – Cafe Au Lait, Espresso Intenso, Grande Intenso. Unlike most of the other milky variants that come with a separate milk capsule, this is the first and only variant to combine milk and coffee into one capsule. What I Like About It: The coffee leaves a pleasant chocolatey aftertaste. Unlike the other milk-beverage variants I’ve tried from Nescafe Dolce Gusto, there was no hint of sweetness (I take my coffee black or with milk … but never with sugar) at all. The “Umm” Part: However, I do think the coffee could be a lot more robust. The milk dilutes the coffee and it’s resulted in the coffee turning out to be a bit bland and one-dimensional. One capsule can make a 180ml drink. You can immediately tell this is going to be a strong cup of coffee. When I popped the capsule into my machine, the strong smell of coffee immediately wafted into my nose. What I Like About It: Well roasted coffee that tastes like the Americano most upmarket coffee joints sell. It’s got a rich, aromatic creama layer. The smell of the coffee greets you with every sip you take. I really like this. The “Umm” Part: While the brand says one capsule can make you a 180ml drink, my personal opinion is that you stop the machine the moment you see the flow of coffee starting to lighten a bit. This coffee is best drunk strong and undiluted so be sure not to let too much water in. A capsule makes a 50ml cup of coffee. You immediately tell this is going to be like getting a strong, hard kick because the capsule is black in colour. What other colour can convey intensity better than black? What I Like About It: Powerful, rich and, I may say so, very flavourful. When you smell the coffee, you can detect notes of wood and citrus in it. When you drink it, the oak-y notes come out even more clearly. This is better than the espresso I’ve drunk at some established cafes. My favourite of the three. The “Umm” Part: There is no “umm” to this one. I really like it. It would be wise to drink this when you’ve had some food inside your stomach though. I drank it on an empty stomach and had to grab a sandwich soon after cos my stomach got, evidently, as excited as my brain. 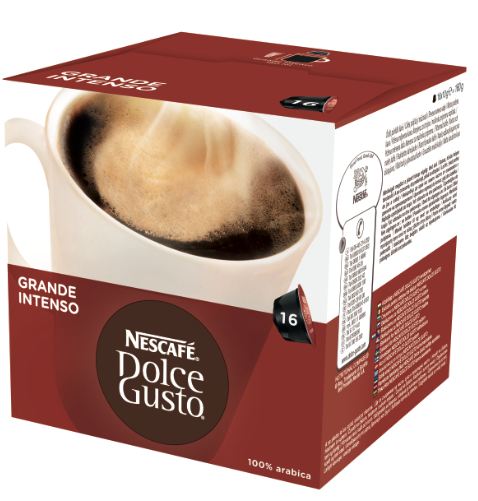 The Nescafe Dolce Gusto Melody Automatic System and its range of Capsules are sold at all electrical chain stores, selected department stores, selected supermarkets, and authorised dealers. The Melody has a recommended retail price of $279. The capsules retails at $10.90 for a box of 16. 2. Click the Facebook share button below and SHARE this review with your friends on Facebook. 3. Tag Material World’s Facebook page. 4. Private message us your details (Name, Gender, Age, Occupation, IC Number, Email Address). 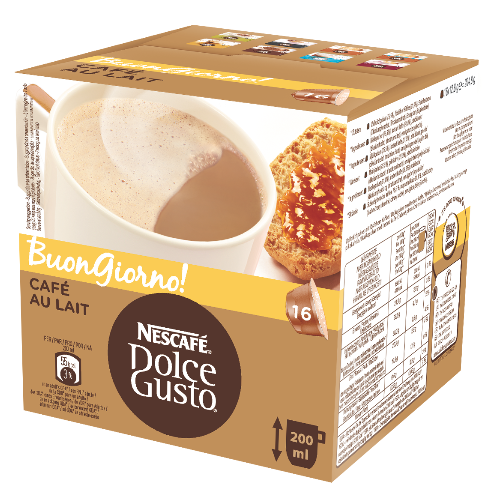 Be sure to state that you are entering the Nescafe Dolce Gusto contest. Only followers of Material World is eligible for this contest, please Like our Facebook Page here. Failure to follow all 4 steps above will result in disqualification. Winners will have to be prepared to collect the system and the capsules in person at a time and place stated by Material World. We will not be sending the prizes to you by mail or by courier, please take note. Contest ends 27 May, 2013. The author used her own Piccolo system to make the coffee. Information about the Melody was taken from the press release. The capsules were given to Material World for review purpose. All opinions are the author’s own. About The Author: Deborah Tan is a founder of Material World. After 10 years of working in magazines Cleo and Cosmopolitan Singapore, she is now a freelance writer/editor who works on this website full-time. She likes liquid eyeliners, bright red lipsticks, tattoos, rock & roll, Mad Men, Suits, and cannot start the day without some caffeine in her. Follow her on Twitter @DebTanTweets. 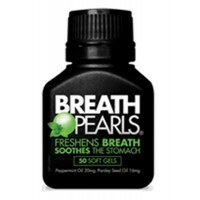 Two weeks ago we posted up an article explaining how Breath Pearls work to freshen up the breath. We also mentioned how we were in awed of the pearls’ ability to soothe any stomach discomforts. This week, Material World has been given 15 bottles of this wonderful product from the exclusive distributor of Breath Pearls in Singapore. 2. 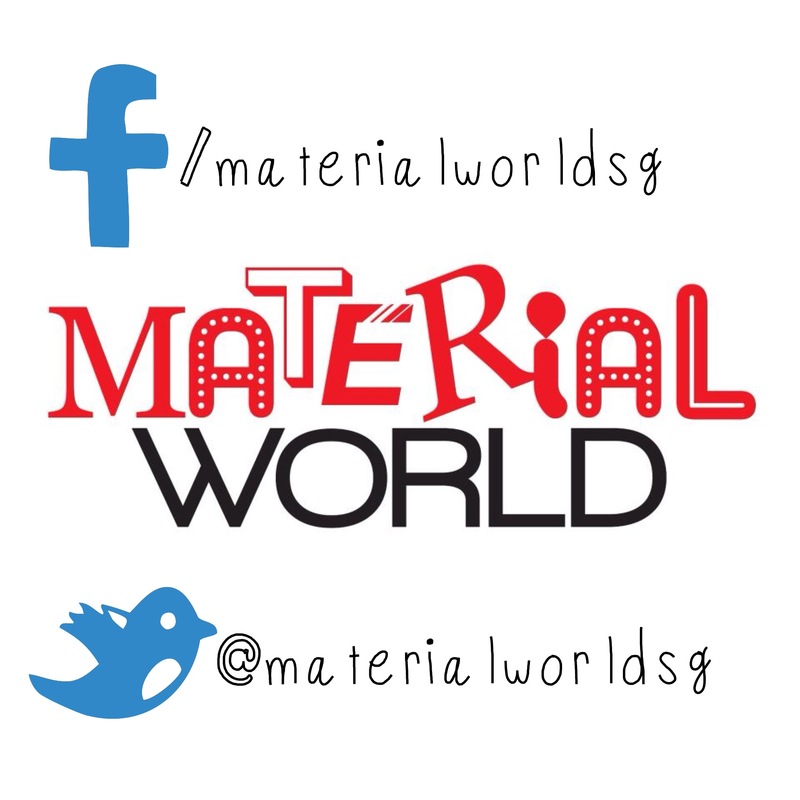 LIKE Material World’s Facebook Page here. 3. SHARE this post with your friends on Facebook. 4. TAG Material World’s Facebook Page in your post. 5. PRIVATE MESSAGE Material World’s Facebook Page with your Name, NRIC, Age, Email Address and Occupation. This contest ends Sunday, 28 April, 2013.